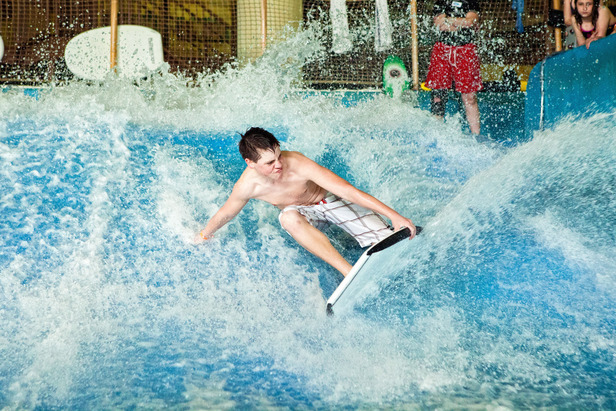 Rip Zone surf simulator at Avalanche Bay Indoor Waterpark at Boyne Mountain Resort. Kick back with spring break activities for the whole family between March 23 and April 7 at Michigan’s Boyne Mountain Resort. Adults will certainly revel in sunny spring skiing conditions, but it’s the kids who are given free reign of the mountain on and off the hill. Back-to-back events on March 23 will keep kids, ages 4-20, entertained during the day with friendly competitions like the Silly Slalom Race, an Egg Race or the Seal Slide. When the family needs a break from lapping the chairlift, a zipline tour or a spin on the new slopeside Gyro Loop ride adds a boost of adrenaline, while the Avalanche Bay Indoor Waterpark keeps adventure going well beyond the snowy slopes. At the end of the day, stop by Mountain Grand Lodge and Spa for all the necessities to craft a perfect s’more or a complimentary horse-drawn wagon ride every evening. It’s the perfect blend of on-hill and off-hill spring break events for the family that wants to do it all. For a full events calendar, visit Boyne Mountain’s website.